Shootout Baseball & OKC Dodgers Partner Together For The B12 Conference Tournament. Shootout Baseball is excited to host our annual B12 Baseball Tournament May 24-27, 2019. This event has been one of the biggest tournaments in the State of Oklahoma for years. 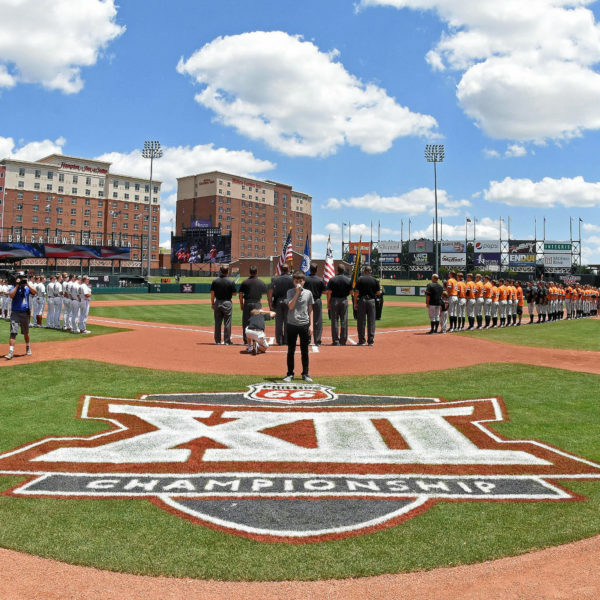 Teams from different states compete in our tournament and take in a session of college baseball to watch their favorite team compete for a Big 12 Championship. We encourage all teams to get out and enjoy the college action in between your youth games. Teams that order session tickets “MUST” coordinate with Shootout Baseball for scheduling purposes. It is not the responsibility of the Big 12 to notify Shootout Baseball. Team Head Coaches MUST notify Shootout Baseball. Once the schedule has been made public it will not be revised. PLEASE, make the appropriate notifications so we can schedule accordingly. Thank you for playing Shoot-Out Baseball.